All New and Recently Updated! Have you ever thought about teaching quilt classes? This 26 page (5 1/2" x 8 1/2") booklet tells you step-by-step how to get started. 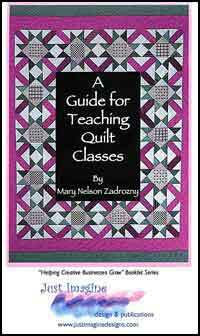 This booklet includes a resource section with books and web sites for more information on quilting, and quilt teacher directories. Only $7.95 (plus shipping & handling). For U.S. orders only, purchase using PayPal by clicking on the "Add to Cart" button below. *For international orders please see our Ordering Information Page.